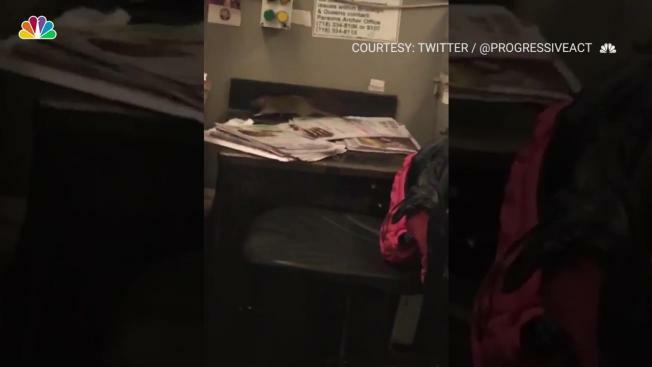 A monster rat apparently chased an MTA worker out of her station booth in Brooklyn over the weekend, leaping on top of papers and scurrying over a keyboard as the person wielding the camera shakes in fright, video shows. In footage the group Progressive Action posted to its Twitter account late Sunday, the rodent is seen racing around on a small desk, where papers appear to have been hurriedly abandoned, in the station booth at the Grand Street Manhattan-bound L train stop the day before. As the camera quivers, the rat is seen leaping from surface to surface, scampering up behind a computer, then emerging and running across another tabletop. "Where'd he go?" is heard on the video, as the video shooter madly pans around outside and inside the booth looking for the rat. Then the camera holder steps cautiously into the booth and focuses in ominously on a green radiator. In its initial Twitter post, Progressive Action asked a number of questions, including whether the booth had been sanitized and why workers should be exposed to such infested conditions. According to reports, the MTA said the safety of its workers and customers is paramount and that it's continuing its work to curb the rat population in the subway system.